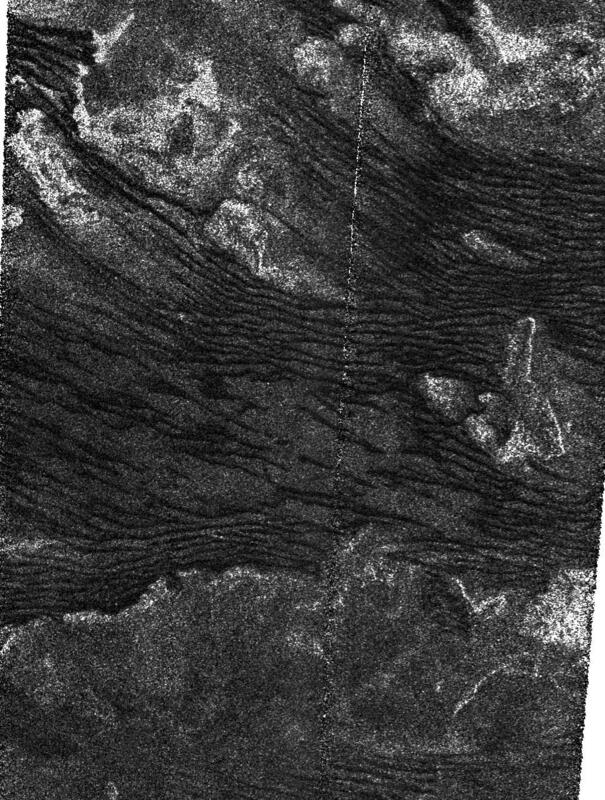 Thousands of dune-like features on Titan. Credit: NASA/JPL/Cassini-Equinox. How can dunes form in an environment “wet with hydrocarbons”? Dune formations have been found in four locations in the Solar System: Earth, Mars, Venus, and Titan. In one instance the average temperature ranges from between 15 and 17 Celsius, with an environment rich in liquid water. In another case, the average temperature is minus 50 Celsius with no liquid water at all, while an average of 460 Celsius on a scalded lava planet makes up the third scenario. The surface temperature on Titan averages minus 180 Celsius. It is so cold that if water were present it would be more like rock and would not contribute to any chemistry on the frigid world. What force can create patterns of fine particles heaped into regular piles, some hundreds of meters high, despite the disparity in environments? On Titan, the so-called “dunes” are quite large, being visible from the Cassini orbiter thousands of kilometers away. 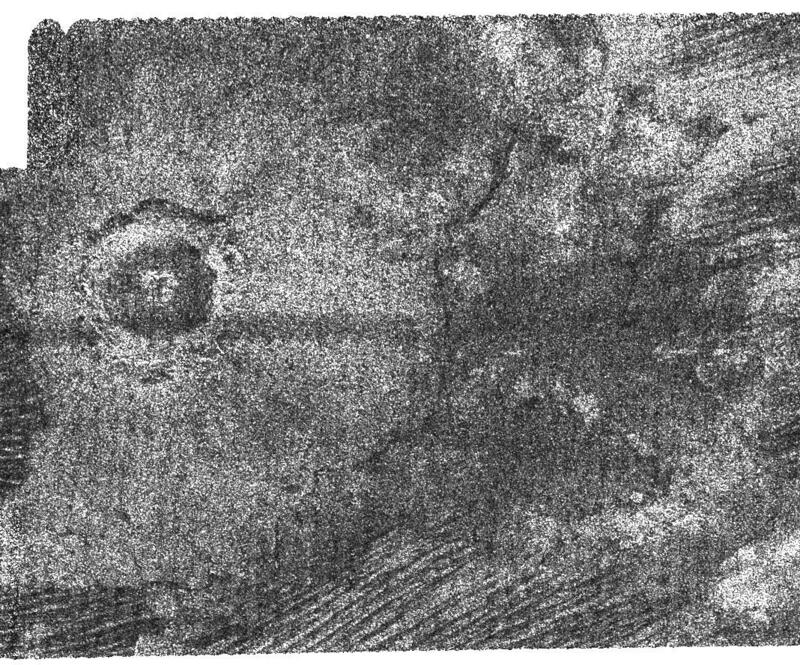 They are also well-defined, almost solid-looking waves that pass over craters and around what are called on Mars “yardangs.” The dunes appear to follow the prevailing wind patterns on Titan that blow a mere 8 kilometers per hour, but they also have some unusual characteristics that may mean they are not generated by wind in the conventional sense. Many of the dunes look like fingerprint patterns—they have whorls and arches that are crisscrossed by other ripples in a perpendicular arrangement, looking almost exactly like the dune fields found along the coast of Namibia. On Earth, dunes are found only in the driest places. The sand grains and dust must be able to slide freely over one another for the dunes to pile up and move across the landscape. Strong winds are usually required to move the sand. In some places, such as Australia’s Simpson Desert, sand dunes have become fossilized and immobile, although they cover thousands of square kilometers. Whatever deposited the sand there was unable to move it again, so they have crusted over, plants have taken root, and gullies have formed. 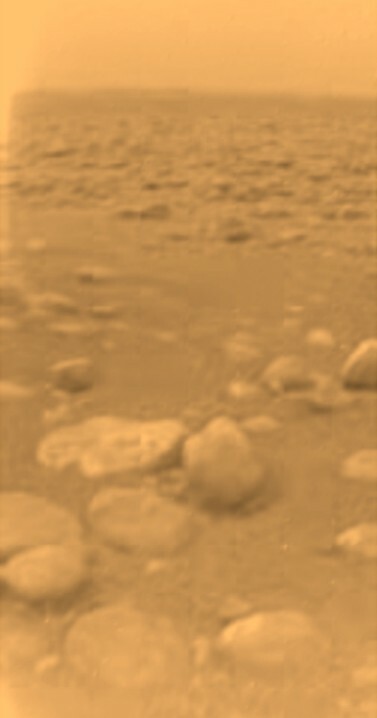 It has been speculated by mission team members that Titan is “wet” with hydrocarbons. In fact, when the Huygens probe landed on Titan, it sank slightly into a somewhat friable surface. NASA planetary scientists described it as “like wet snow,” or “loose clay,” or more significantly, “dry sand.” There was detectable methane in the area surrounding the probe, but it quickly dissipated—presumably because of the heat emanating from the lander. In such deep cold, the temperature of an ice cube would be boiling hot. 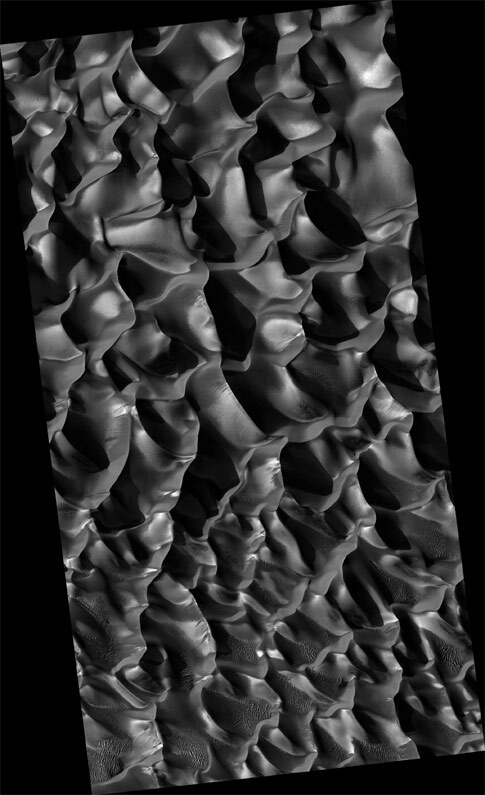 If Titan were wet, despite its low gravity, the winds (really no more than gentle breezes) would not be able to accumulate material into long dunes. Any moisture would cause the dust to become sticky and any larger grains would be mired in the slush. With such minimal wind speeds recorded by the Huygens lander, it stands to reason that Titan is dry, despite claims from NASA that there are “lakes” of liquid ethane and methane on its surface. 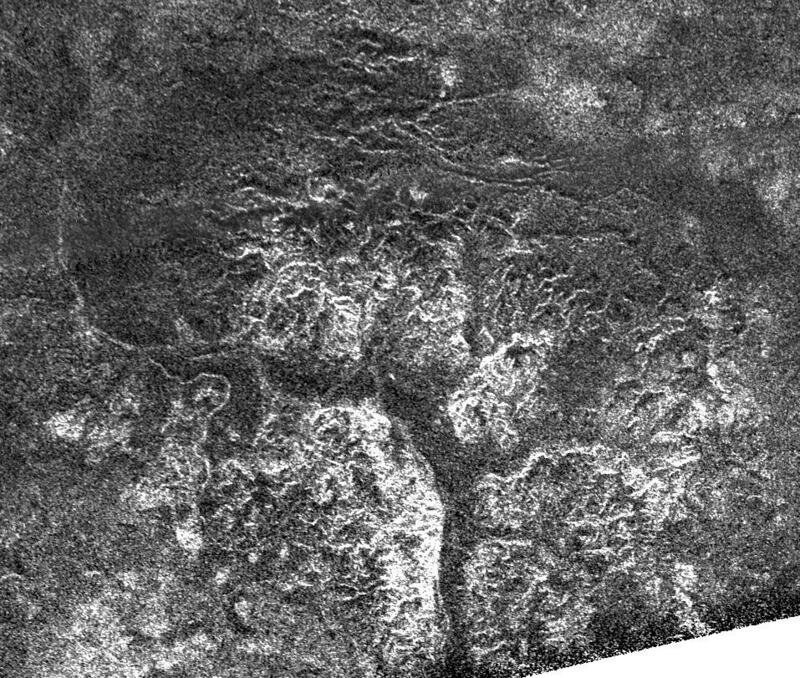 So, if Titan is dry and there are craters with folded rims and wide, flat bottoms (often with more than one tier or concentric basin), parallel fractures, large domes similar to those on Venus, and Lichtenberg figures (called river channels by the Cassini team) incised into the terrain, then perhaps a better explanation for what happened to Saturn’s planet-sized moon might be found by considering Mars. On Mars the dunes have been identified with electric arcs. When the discharges excavated material from the strata, they blew it upward along the path of current flow where it then fell away, forming what are called “wind streaks.” Dust is most likely charged on Mars, so particles can be attracted or repelled from one another, depending on their polarity. Therefore, they will align themselves in much the same way that iron filings will align themselves with the magnetic field of a bar magnet. 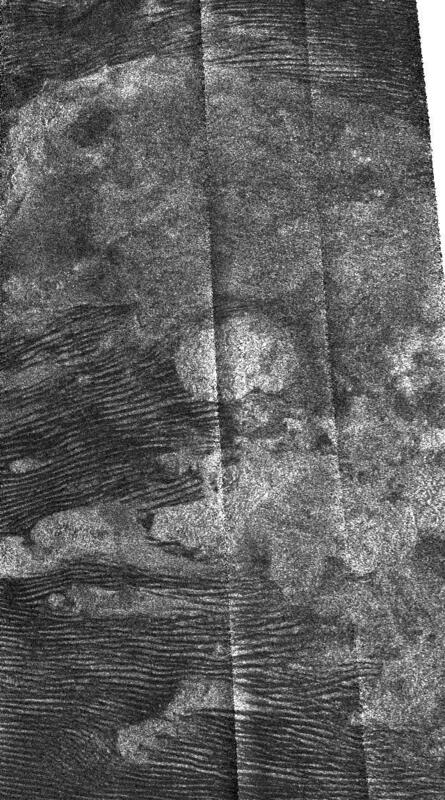 It is possible that that is the mechanism behind the dune structures on Titan, as well. In the equatorial latitudes of Titan is a great “sand sea” called Belet. If, like Earth, Venus, and Mars it represents the fragments of rock strata that were destroyed by electric discharge activity and then ionically deposited in masses of sand larger than the State of Michigan, it is probably the source for the dunes and streaks of fine dust. 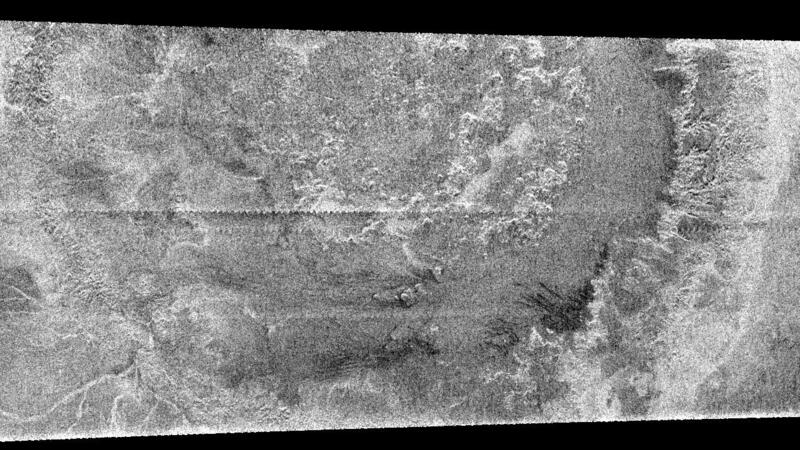 Streaks and dunes have also been discovered on Venus. Most of the time, they are associated with craters and sinuous rilles; the edges of both formations are often dusted with dark or light colored grains. Titan’s dunes are so similar that “blueberries,” or other spherical pebbles and stones, may be found if a rover-type lander ever pays a visit there. 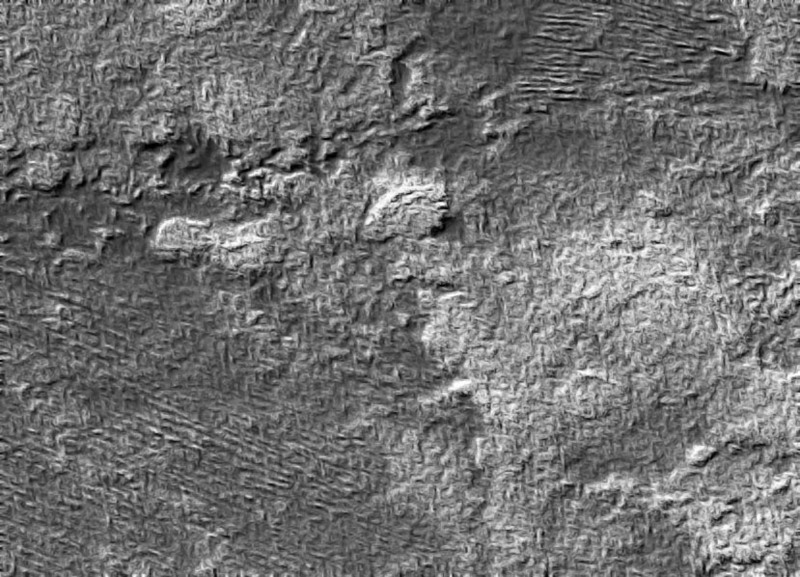 Dry, cold, covered with sinuous rilles, gigantic craters, chaotic topography, and thousand-kilometer ridges of piled-up dust 500 meters high, Titan is one more example of catastrophic devastation among the Sun’s family in the recent past.